I just love the caramel notes from the dates, with a hint of ginger in this moist & luscious cake. It’s a recipe I first found in Annabel Langbein’s cookbook, but I’ve reduced the sugar because I found it too sweet when served with a toffee sauce. 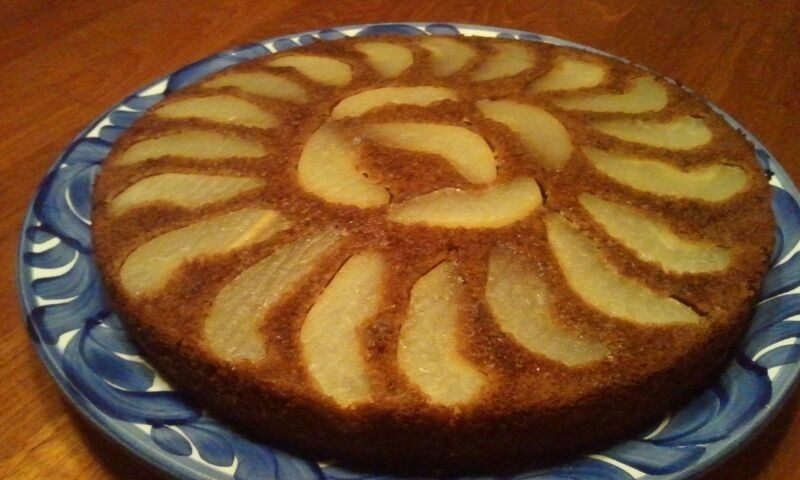 Original recipe also calls for slices of pears arranged at the base of the cake tin, so that when you turn the cake over and out of the tin, you’ll get a pretty layer of stewed pears at the top…and a couple of ooh’s and ah’s from your guests! Best part about making this cake is that it’s easy, everything into 1 pot, and hence, very little washing up. For Patrick’s 19th birthday, I had a host of things to prepare so this was the perfect fuss-free recipe that I could make ahead of time. And since I didn’t have pears, I decided to bake it in a muffin tin, serve it with salted caramel and a dollop of yoghurt. Preheat the oven to 180’C. Butter the muffin tin. To check the dates, I cut each one in half just to make sure that all the pits have been removed, I occasionally still find 1 or 2 with pits still in them. Place the dates, water and baking soda in a pot large enough to hold the entire cake batter, and boil for 5 minutes. Remove from the heat and mash it while it’s still warm to break up the dates. Stir in the butter cubes and mix till the butter has melted. Then mix in the sugar, eggs and vanilla, then fold in the flour and ginger. Pour batter into the muffin tin until it’s three-quarters full. Bake for 13-15 mins till skewer inserted in the centre comes out clean. Keeps well in the fridge for 2 days or in the freezer for much longer….Thaw and reheat in oven. 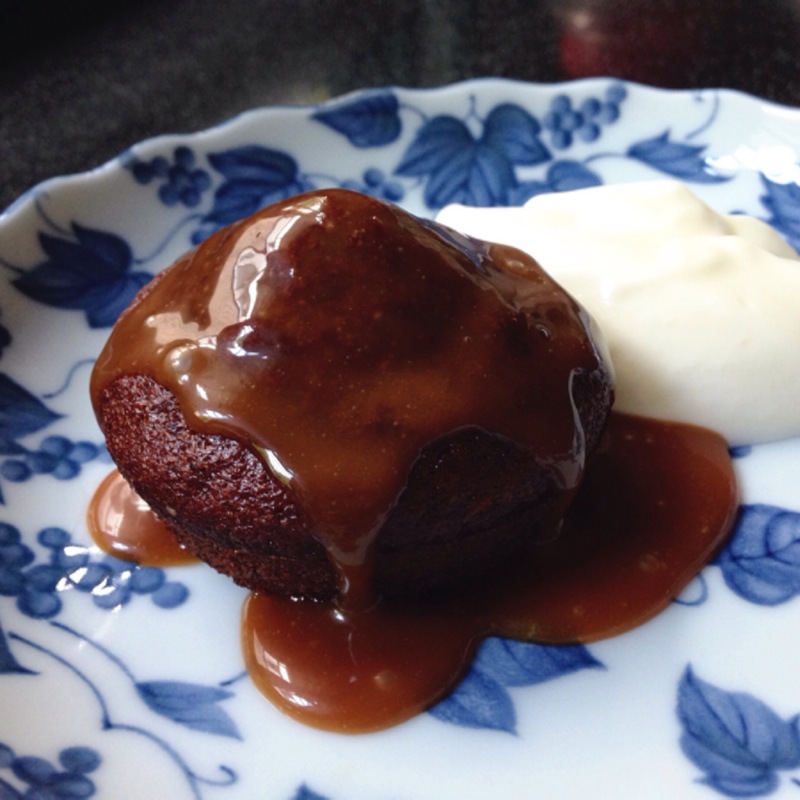 Best served warm with a salted caramel sauce and frozen yoghurt! Salted Caramel …1 amount of cream, twice the sugar and a lot of patience! Heat 1 cup of fine sugar in a medium saucepan over medium heat until the sugar dissolves and comes to a boil, swirling the pot now and then. Do not be tempted to stir the sugar as this will cause it to crystallize. Run a wet brush (heat-proof silicone brush) around the sides of the pot. Once sugar is melted and turns into an amber liquid, add in 90g butter cubes and stir till melted (2-3 mins). Drizzle in 1/2 cup of double cream and stir well. Be careful as this will splatter! Allow to boil for less than a minute. Remove from heat and stir in 1 tsp of sea salt. Covered tightly, it stores well in the fridge for up to 2 weeks. Warm it up before serving to achieve a nice pouring consistency. Whisk together 500ml Greek style yoghurt, 100ml cream, & 165g sugar till the mixture is smooth and light, and the sugar has melted. Freeze for 2 hours. Thanks Arielle, my son loves this!